The Youth Build project is a comprehensive programme that integrates academic achievement, work experience, social action, leadership development, and personal transformation in a single project for a period of 12 months. This is in response to the challenging academic environment in our country in which a lot of school leavers or matriculants and high school drop outs are unable to access educational and work opportunities. Every year the NYDA in partnership with National Department of Human Settlements (NDHS), Provincial and Local Government initiate, plan and implement a Youth Build projects better known as ‘Letsema’ where young volunteers build houses and refurbish community structures such as schools and libraries. As part of the Youth Month programme, the NYDA is proud to launch the first of two Youth Build initiatives in partnership with the National Department of Human Settlements proudly. The second, programme wholly supported by the NYDA’s Youth Build programme will be launched in Umtshezi, KwaZulu Natal on 13 June 2013. Youth Build remains one of the NYDA‘s flagship projects, aimed at skills development, promoting Youth Service and the creation of employment for young people. Youth Build allows young people to volunteer as artisans in building low cost housing, conducting maintenance work on schools and community centers among other small scale construction activity. Small stipends are paid to volunteers; however the main aim of the initiative is to provide opportunities and an enabling environment for youth to become agents of change and to develop necessary skills. The KwaLanga Youth Build initiative has allowed for over 100 young people to participate in the construction of 76 houses for the elderly and vulnerable groups: refurbish social amenities such as schools, Early Childhood Development Centre’s (ECDC), community library as part of legacy and aftercare projects; and build 16 houses for the elderly, destitute and victims of fire whose homes were burnt last year. “Service is a proven strategy for reconnecting disconnected young people to their communities. It is also a strategy for nurturing a shared value system based on respect and dignity for self and others. Thus we must elevate and expand youth service beyond national boundaries. In doing so, we will not only build local bridges for social cohesion but begin construction on international bridges as well,” says Pillay. The aim is to see that everyone gets good food to eat, clothes to wear, houses to live in and basic services for all. Young people represent a diverse and resourceful cohort waiting to be mobilised to achieve this aim. Young people can be a resource for providing integral services to their communities, for providing the good food, the quality housing, clothes to wear and basic services for all. 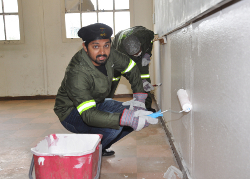 IMAGE Caption: NYDA Executive Chairperson, Yershen Pillay helps paint one of the classrooms at Langa High School as part of the Youth Build launch in the Western Cape.